While thoughts of a high fiber diet plan might conjure up visions of bland wheat germ, endless bowls of bristly-tasting cereal, and other boring fare, bear with us. This extensive high fiber foods list offers an abundance of delicious foods with plenty of color and flavor. There are more benefits that come with enjoying more of the foods found on our high fiber foods list: Lose weight easier, absorb minerals better, enjoy a healthier immune system, and watch your cholesterol levels drop to healthier levels. Let’s get started! If you’re not getting enough fiber, you might be worried that it will be difficult to get enough. Luckily, there are some very easy ways to get yourself onto a high fiber diet plan while continuing to enjoy favorites. Have high-fiber cereal with breakfast, and top it with berries or your favorite dried fruit. Ease your way into the habit by mixing your new high-fiber choice with an old favorite. Snack on raw veggies, fruit, and nuts, and be sure to leave the skin on your fruits. Asian pears, apples, pears, and berries are among the best. Treat yourself to air-popped popcorn once or twice per week. It’s far better for you than the microwaved stuff. Add ground flax seeds (also known as flax meal) to soups, stews, and sauces. The flax adds lots of fiber without imparting flavor, plus it acts as a natural thickener. Top yogurt and desserts with chopped nuts, fruit, or seeds. Munch on a handful of trail mix once each day. Swap processed grain products for their whole-grain counterparts. Breads, crackers, muffins, wraps, and tortillas are some examples. Use whole grain flour when you bake. If you don’t like the h2 taste of whole wheat flour, consider giving oat flour a try. Start meals with veggie-heavy soups or salads. Try fiber-rich pasta instead of the regular type. Look for high fiber recipes that mimic your old favorites. Whatever it is you like, there’s probably a higher fiber version available. In a pinch, simply add more whole fruit or vegetables to your existing recipes. Learn to love beans. Mix them into the foods you already prepare, snack on hummus, and consider replacing one or two of your main meat containing meals with meals that call for beans as a protein source. Chili and burritos are the ideal starter meals, and so is pasta e fagioli. If you like curry, it’s another great meal that’s easy to make with beans in a starring role. How Much Fiber Should I Eat Each Day? You might be shocked to discover that most Americans eat far less fiber than they need to. At minimum, a good high fiber diet plan should offer 30 to 40 grams of fiber. The more you eat, the more you’ll benefit – so feel free to exceed these guidelines if you feel like it. 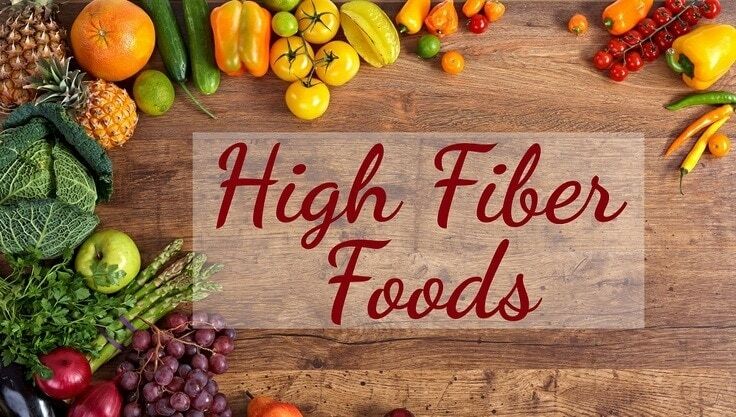 While this high fiber foods list contains over 200 delicious foods to add to your diet, keep in mind that almost all vegetables, fruits, seeds, nuts, and legumes will provide you with a healthy dose of fiber. Enjoy a wide variety of high fiber foods and reap the benefits! Please include attribution to EasyRecipeDepot.com with this graphic. Besides enjoying foods from this list, consider checking out Mayo Clinic’s high fiber foods chart for more ideas. Advertisers have convinced kids that they need to eat lots of processed, packaged foods in order to have fun. Unfortunately, the majority of processed foods don’t contain adequate fiber. While “fun” foods are fine for kids to eat on occasion, they should be viewed as treats rather than mainstays. Luckily, there are plenty of high fiber foods for kids, all offering great taste and plenty of visual appeal. Many of the foods suggested on the main high fiber foods list are suitable for children, plus you can try some of these kid-approved treats next time you’re planning meals and snacks for the younger members of your family. Besides these easy ideas, you can add chopped fruit to cereal, and add extra veggies to favorite foods. Pureeing fruits and vegetables lets you add fiber to foods that normally contain very little, and allows you to “hide” the healthy food in familiar favorites. Do try to teach your kids to enjoy a variety of healthy, high fiber foods by gradually introducing them to new things in a way that seems fun and special. Try having them help you with food preparation: They’ll be very excited to try their creations! Fibre rich Indian food made with lentils, vegetables, potatoes, and other veggies can help: Try with brown rice instead of white. Additionally, consider high fiber recipes such as vegetable stews and soups that help increase both fluid and fiber intake. Paired with salads and vegetarian or vegan entrees, fruit-based desserts such as apple crisp with oatmeal topping, and fiber-rich snacks, they’ll help you feel better fast. Make exercise a priority, and be sure to drink plenty of water each day (8 glasses minimum) for rapid relief. Paired with a high fiber diet plan that focuses on whole plant-based foods, these tactics combine to provide a quick solution to uncomfortable constipation.